Imaginary Beings: Mythologies of the Not Yet collection, includes 18 sculptures of ‘beings' inspired by Jorge Luis Borges' Book, ‘Imaginary Beings,' an encyclopaedia of imaginative zoology that contains descriptions of 120 mythical beasts from folklore and literature. Each ‘being’ in this series encapsulates the amplification and personalization of a particular human function such as the ability to fly, or the secret of becoming invisible. Ancient myths are united with their futuristic counterpart, brought to life by design fabrication and 3D printing technologies. 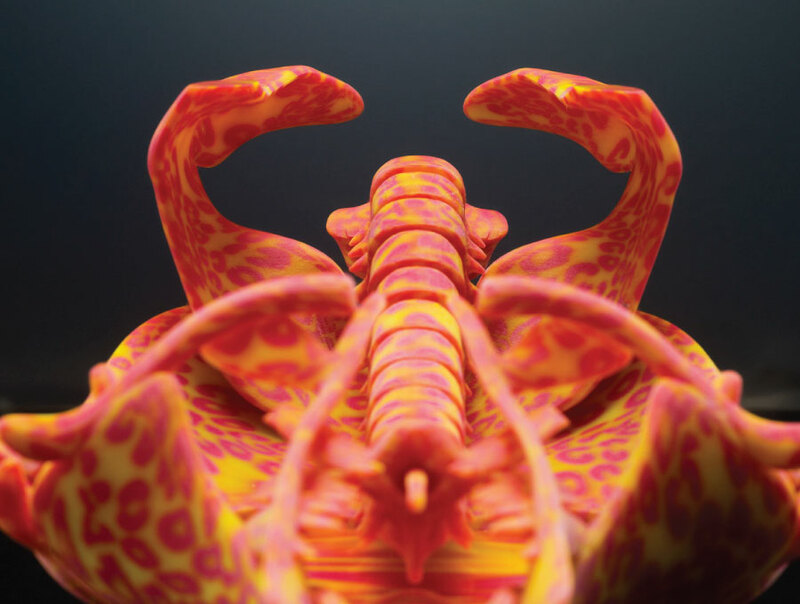 Kafka demonstrates the powerful combination of 3D printing and new design algorithms inspired from nature. Drawing inspiration from author Franz Kafka’s famous novel, ‘The Metamorphosis’, Oxman sets out to represent a physical, wearable metamorphosis: a material counterpart to Kafka’s chimerical writing. Kafka's intentional use of ambiguous terms in the novel, inspired here an equally ambiguous use of physical properties and behaviour, embedding several functions. The bestiary artwork is composed of several animal parts and combines a soft internal texture with stiff armor-like material. Greek for 'air in motion', the ancient word Pneuma is used in religious contexts to denote the spirit or the soul housed by the human ribcage. Pneuma 1 marks a series of design explorations depicting this ethereal constituent in material form, as a housing unit for the spirit from which breath emerges. Inspired by animals of the phylum Porifera such as sponges, this soft armor is designedto protect the body while providing comfort and flexibility. 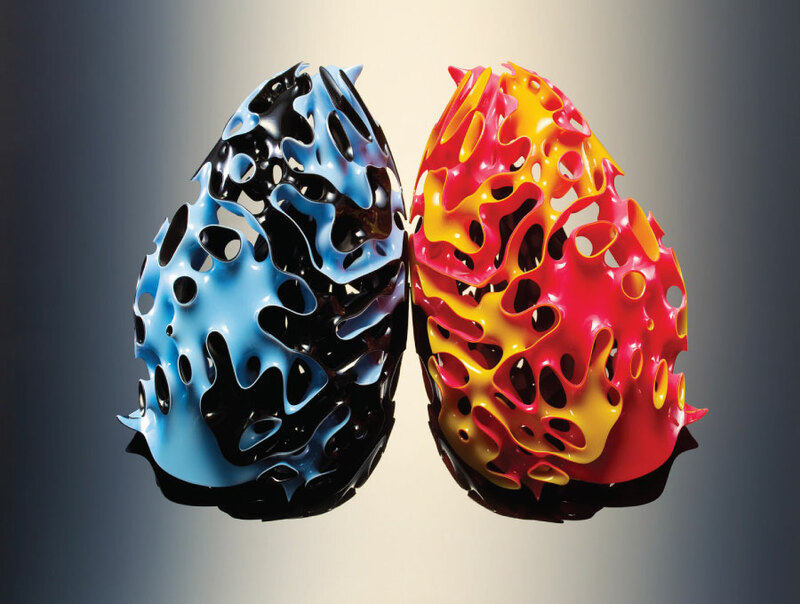 Two bodies filled with pores and channels allowing air to circulate throughout are printed using multiple materials with varying mechanical properties making up the stiff continuous shell and soft inner regions. The imaginary being, Arachne, is inspired by the myth of Arachné, the mortal weaver who was transformed into a spider by the Godess Athena. 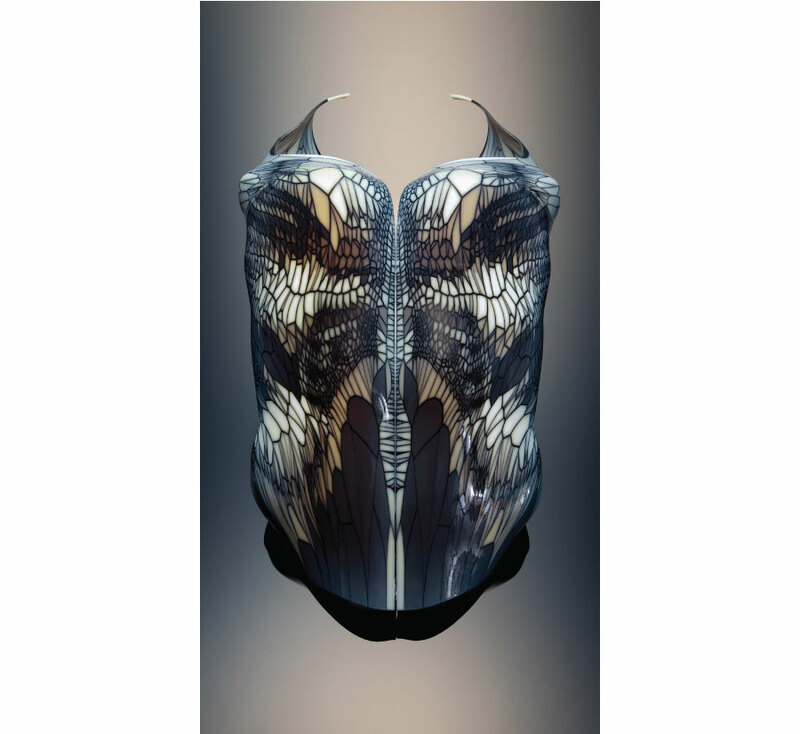 The 3D printed corset is inspired by the construction of a spider’s web. The piece combines shades of blue and white in both rigid and flexible materials, providing a protective armour for the rib cage, while the softer materials around the inter-costal muscles enhance movement and comfort. In more ways than one, spider spinnerets can be seen as the antecedents of multi-material printers. Able to produce up to eight different silks during their lifetime, each spinneret gland within a spider’s abdomen produces a thread for a special purpose: sticky silk is produced for trapping prey and fine silk for enshrouding it.